Whoa. What a breakfast! Had I cooked first and written my last post later, I’d have told you that I can see why Troy Walker had such fond memories of the French toast he served and enjoyed when he worked for the Santa Fe Railroad. 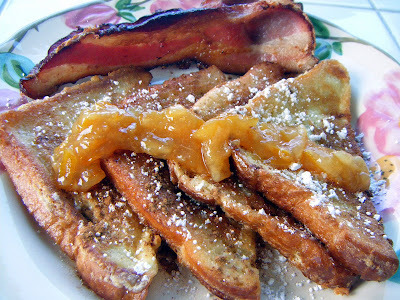 Calories be damned (and trust me: there are plenty in that recipe), it’s the best French toast I’ve ever made — or eaten. Was it the bath in creamy custard? the deep frying in hot oil? the extra crisping in the oven? Maybe it was my buddy Leslie’s homemade meyer lemon preserves adding that certain je ne sais quoi as a garnish? Perhaps it was all of the above. Try it, you’ll love it. I sure did!